Do you believe that you have more potential to contribute or achieve? Most people would say “yes.” But how do we tap into our potential and purpose? Over 70% of people have no conscious idea of their Personal Style, strengths, values, interests, gifts, or talents? Up to 95% of illness is related to lifestyle? Most people don’t have any clear vision for their future? In fact, most individuals will spend more on entertainment this weekend than they are willing to invest in their own professional development this year! So where do we start to make changes? To realize our potential, we must make a commitment to work on ourselves. Without self-awareness, we will be unable to make intentional decisions. It’s important to fully understand our preferences and how important they are to all our life choices. In five separate studies, the process of clarifying and documenting values resulted in increased confidence, reduced stress, increased wellness, improved objectivity, enhanced decision-making capabilities, and increased resilience to challenges and problems. Are you clear about your core values? What about your gifts, talents, and abilities? 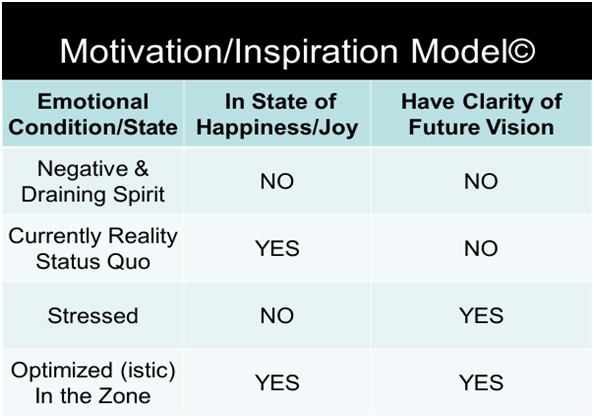 The following Motivation/Inspiration Model© can help you understand how to live “On Purpose,” realize your potential, as well as provide a way to see and nurture the potential and purpose in others. Although there are many factors, I will reference two that specifically affect your ability to realize your potential. It is impossible to realize your potential if you are miserable, down, and unhappy. That doesn’t mean every moment will be filled with joy, but consider whether you are generally feeling grounded and centered. The now is the only place any of us can ever live, so why not enjoy it? A wave of research is underway in the area of mindfulness and the importance of being present in the now. Consider also your mindset, or the way you are experiencing your life—your level of happiness. All your thoughts and actions have an impact, and you cannot realize your potential unless you are in a place of contentment. Are you joyful in the moment? If I were to ask your co-workers, family, and friends, what would they say? When people interact with you, are they better or worse for it? We have a choice about how we will react and respond to what life hands us.Are you intentional about your joy and happiness? If we are miserable, whining, and constantly complaining (displaying lack of joy/happiness), people won’t be inclined to support us, or even be around us; that is just common sense. Further, unhappiness is contributing to our increased stress and illness levels. Over 50% of the global workforce feels highly stressed! If you are not content in the now, then you are not realizing your full potential. Recently, it has been suggested that smart goals do more harm than good; however, having a vision is critical to realizing potential. Vision should be an active-tense condition, always in play—something you are working toward achieving. Hope (which refers to the future) is very powerful; it drives people to become and do more. You might be familiar with Viktor Frankl, author of Man’s Search for Meaning, who lived in German prison camps during the Second World War. In his book, Frankl states the reason he survived (and others did not) was his daily vision (hope) of reuniting with his family. That gave him inspiration, determination, and strength when others despaired. His statement that “others can take everything from me but they cannot take my vision or dreams” is one we can all embrace. If we have no future vision, then what will inspire us to become and do more? Realizing our calling, purpose, and potential takes us to a place of fulfillment and encouragement. Everything that has ever been achieved by the human race was first envisioned. What are my visions and dreams? Who would I like to become? What am I called to be and do? What is my purpose? Most people are not clear on the answers, and it takes effort and time to be diligent in seeking them. Not everyone is committed to the process—but are you? My newest book, The Quest For Purpose,provides a roadmap for those seeking to live a life full of purpose and joy. The Motivation/Inspiration Model© is just one chapter in the book. Decideif you are willing to invest both time and money in your development and if you’re ready to make the changes required to realize your potential. If so, do it! Determine whether you are living in a state of joy and happiness, and living in the moment. If not, what choices will you have to make to shift into that state? Cultivate self-awareness and gain a clear understanding of your preferences, values, gifts, talents, and abilities. Consider what others might be saying about you. Are you a person whom others like to be around, or do you drain their energy? Do you need to make changes to create a more positive impact? True purpose and joy are also spiritual matters. Investigate and/or strengthen your connection in this area so your joy can be sustainable and self-generating. By making a commitment to do the work necessary to realize your potential, you have the opportunity to transform your own life, and ultimately the lives of those around you. He is also the author of Why Aren’t You More Like Me? Discover the Secrets to Understanding Yourself and Others, and co-author of Deliberate Leadership: Creating Success Through Personal Style. He co-created CRG’s proprietary development models, and has written more than 3.5 million words of content for 40 business training programs, and over 500 articles. Ken’s expertise includes assisting individuals, families, teams, and organizations to realize their full potential and to live On Purpose!